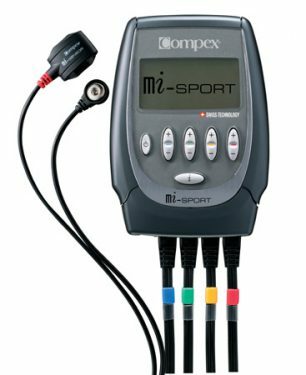 Neuromuscular electrical stimulation (NMES) can be a beneficial supplement to traditional forms of therapy in the patient who finds a muscle function is reduced either by inhibition (post injury) or even the period post-surgery (e.g Knee). This inhibition may demonstrate itself as either weakness, with or without loss of bulk (atrophy), or even the lack of ability to “switch” the muscle on despite the patients best efforts! A specific muscle or group of muscles can be targeted by placing simple “sticky” electrodes at certain points over a muscle to gain a variety of different muscle effects by “exciting“ that muscle. A great example is the rehabilitation of most knee conditions where one of the quadriceps muscles, the Vastus Medialis, can waste very quickly indeed. You will recognise this muscle as the “teardrop” shaped muscle on the inside of the knee. By stimulating this muscle very soon post injury or postoperatively you can not only keep the muscle firing but can maintain some of its bulk. Later on in the rehab, you can perform simple exercises such as step ups or squats along with the muscle stimulation to make quicker and better gains in muscle strength and function. It has been reported that after knee joint replacement, a patient group who engaged in highly intensive activation of the quadriceps muscle using electrical stimulation produced better results for strength and muscle activation compared with a control group.29 Comparable studies conducted after anterior cruciate ligament (ACL) reconstruction produced.